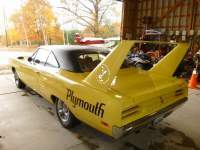 DodgeCharger.com Forum > Discussion Boards > Aero Cars (Moderators: Chryco Psycho, hemigeno, firefighter3931, Charger-Bodie) > Color change on bird. Would like a few opinions on changing color.Have a friend that has a EW1 sixpack bird that he has had for 30 + yrs,having thoughts of changing color to B5,just tired of white.As for decreasing value,doesn't matter to him as he will have it as long as he is alive,after that it would be a family matter.He has had a lot of comments both pro and con,his only hesitation at this point is the time and work involved.Your thoughts. Re: Color change on bird. Family will sell it off for whatever they can get later. It won't matter to them...!!! Will just be less money to split up! IMO it will affect overall value. Whether the current owner cares about future value after he is gone is up to him. 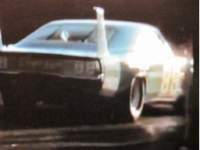 On a white bird, I would either do some custom old school graphics that were easily reversible compared to a paint job , or do a vinyl wrap to his liking. Have the car "wrapped". The cost of a paint job will probably be more than having this done. Buy a blue bird, sell your white bird, even if the blue bird cost more than what you would get for yours, the cost of the paint job added to your bird will probably be a wash. Here, Here Do what you want!! his only hesitation at this point is the time and work involved.Your thoughts. 1. How much extra time and cash does he have available to blow? 2. Will blowing it be equal or lesser than the satisfaction he will get from seeing it in blue? Therein lies the answer, or alternatively, do whatever the wife says. Probably be cheaper and quicker to sell it and buy one in the color he wants. To change the color properly the whole car has to be disassembled and that would take a lot of time and money to do it right. 49 year back order. Have at her with a paint gun. Yes you could sell and rebuy, but i take it this car has some sentimental value after owning it all these years. Correct,he has had this car a "long" time and overall condition is very nice,car has never been messed with,last thing I would do is replace with god knows what. I agree , that makes a lot of sense in most cases. Does the car have the original paint? Survivor? Original Drive train? If yes to any of these questions, I would leave it alone or buy a different car. Everybody always says they will have it forever BUT things happen, plans change and cars sometimes need to be sold. He has read most of what you guys opinions were/are,at this point he is undecided but as for another car,that is out of the question.His age and financial and cost for another car makes that a definite no.My best guess is that in the end he will let it as is but you never know. On another note,I came real close to changing the color on my bird in 82 when I bought it.It had been changed from EK2 to V2 with yellow stripes and I came real close to going with Y1,in the end I decided to stay with the EK2 and never regretted it. Very interesting subject indeed! COLO(U)R CHANGING. As we all know White and Black are not actual colors, nor is PINK, but who would paint a Birdie PINK??? White is a mixture of ALL colors (as our eyes see it) and black is the absence of color all together. B5 is and always was my favourite Mopar color and I believed that everyone liked it too? Then I met a Moparman who hated it with vengeance and that got me to thinking (he owns a white Birdie and loves it). Maybe there are better colors than B5 and that FLAT, non metallic's are just as good, (as per the Birdie above). So why are there WHITE cars? My sister in law always buys white car as they are CHEAPER! Mopar used White for PILOT-cars like the 71 Hemi-Cuda convert, that no one wanted until it became Mega rare and Valuable! Ask yourself this, would you in 1970 go into a Mopar Dealership and order a WHITE BIRDIE??? You had seven choices and probably not a great selection to ponder on. For me a toss-up between EB5 and 999 Petty Blue??? But after what the 'King' said about his 'Petty bird' it would still be EB5 for me. Color changing was very popular once the original paint started to fade or wear through, so like any 're-model' you changed the color! Now most cars are being 'put back' and originality is the 'name of the game'. A Birdie of any color would 'rock my World' as my chance of owning one has passed me by. This Petty Bird was so hated by its UK owner he painted it RED, back in the day! This Birdie was painted 'Black' when he bought it back in the late Eighties. Who would paint a B5 blue birdie Black? B5 will get you in trouble !! There was a real Superbird painted in pink here in Canada and was for sale on Kijiji near Toronto last year. Had a white top though. Was originally a green car if I remember. The blue Bird next to it is his and the pink one is hers if I remember correctly. I like that plate on the back: "Correct Direction"!!! I remember a hot day in Cali, trying to fit a Black nosecone under a shade tree and boy was it HARD! Every time we clamped up the 'Z bars' it would warp the metal and look awful in the bright sunshine. Should have worn cotton-gloves methinks. Are you a convert YET??? No wonder he got stopped, he's driving on the WRONG side of the road!!! Actually it is an original 72 PA police car that was restored in the late 80's,I did the carburetor for that car.That picture was taken at the PA State Police academy just after the car was finished,the bird belongs to a very good friend that was in charge of the academy at that time.Our friend here "hemi68charger" knows him very well. Also,the color is blue and gold,standard color for that year and unless you're in a different country,the side of the road is correct ! Our friend here "hemi68charger" knows him very well. That's Dave !!!??? Now that I know that Superbird very well now, it is him !!! Well I am a purist at heart. I had a yellowbird and the guy that bought it said there were thing he did not like ie including color. I told him go order one, LOL. I feel do not do a color change. There are not enough cars left out there for people to be picky. The value is in the original option sand colors. There was a 70 hemi cuda at barrett jan/19. 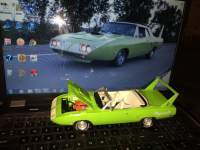 It was an OK car but original color was F8 green with green bucket bench. It took I call a hard hit on value and in end 132,000usd. And bad news unless you dunk the car and strip white paint will always be showing up. Nice white paint showing thru nicks in B5 blue paint. My only question would be is the sentimental value going to be affected by a color change ? Having owned it this long in white , will it still be - HIS - car if its a different color? Ive reached a point in my life we have to enjoy what we have when we have it. But I'll be honest , the purest in me is still trying to trump my thoughts to not let color be a such a major deciding factor for a car purchase. Right now my 2 leading candidates are pale yellow one and a red one. Both white interiors, 2 colors that were never really on my 'want' list but they look killer with white interiors. Sorry for the Fugly comment 62 Max! B5 Blue would deffo be my choice over white but any Bird in any color would be wonderful to me! Been wrestling with a color change on my F8 green C500 to B5 for 15 years and I finally thought NO! F8 is coolio and B5 could be hard to live with, even for B5 lovers like me? Vinyl wrap is the name of the game now and I saw a flat green wrapped supercar and thought it was awful, but others said it was ubercool??? Do what you gotta do, to make your life happy. Paint is just paint, the way things are going in Europe, they will be banned soon (fossil burning cars that is) in any COLOR! Doesn't it all really come down to money? White is not a favorite color in mopar world. It seems to be a subtraction on value even on a wing car. So if this is not a concourse car to begin with, where it would lose that status. It comes down to the desire of the owner. 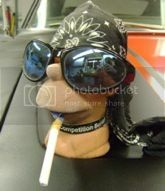 Does he want to spend the money to change color so that he/she has a better enjoyment of the car. Given that it may not be recoverable money. Like making an addition to a house. You never get it all back, but you get some back, and have the added enjoyment of the modification. 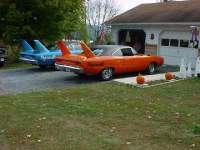 Guy in my area bought non matching EK superbird. 440/4spd for insane money because he had to have it. He then paid to have hemi installed. He then paid to have it painted petty blue. He then paid for a different more powerful hemi. He has the money and he is happy. The car is far past the point of any investment return. But I bet he does not do it. If he is asking for opinions, he/she probably is not really gun ho on the idea. But if everyone told him yes, and you will double your money on the paint job or get it all back, they would probably do it.